Happy Mechsgiving! I would’ve given you a mech, but the garages were shut and, well, frankly I’d forgotten all about it. What do we normally do for Mechsgiving? I can’t recall. 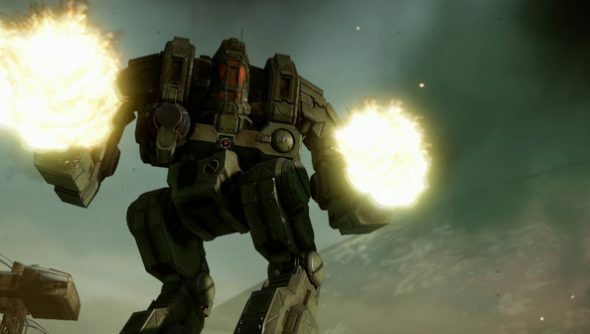 Anyway – Piranha Games are more thoughtful than I am, and have prepared a special update to Mechwarrior Online’s current open beta for the occasion. Included is a new mech and the ‘Frozen City at Night’ map. The former is the Cataphract, pictured above. She comes with jump sets, more armour than you poke a stick through and a “solid offence”. Both her and the map will be on view over on Twitch today at 6pm PST. The update will be made public later this week, and will also introduce new targeting modules and the Beagle Active Probe, which increases sensor range. I grew up with beagles. Lovely dogs, but I wouldn’t trust them to sense anything but the presence of food. Will you be jumping into MO to celebrate Mechsgiving?